Over the past few years, we’ve seen the prices of the first BMW M3 rise to ridiculous, nearly air-cooled Porsche 911 levels. I’ve had the privilege of driving one, and it’s indeed very good, but I often wonder if it’s really worth those insane asking prices. Here is an E30 that is worth selling your kids’ organs for: the BMW 333i. There are three reasons for this: it’s super rare, it’s very unusual and it’s pretty damn rad to drive. Though built in Germany, the 333i is a child of South Africa. Back in the 1980s the E30 3 Series was selling pretty well in that country, as it did everywhere, but they did not get the top-shelf M3. 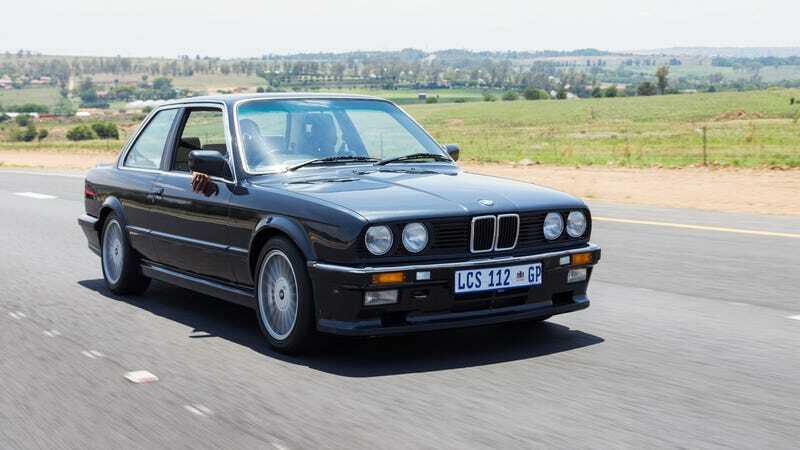 So BMW South Africa decided to make their own, sort of, using the most old school method possible: they swapped in the big 3.2-liter inline six from the 733i and other large BMWs. The little 3 Series never went that big in displacement from the factory, so this big six gave it a decent amount of oomph—a seriously not-bad-for-its-time 194 horsepower and 210 lb-ft of torque, as BMW Blog recounts. Having owned an E30 myself I can tell you that with those numbers it must’ve moved just fine. It also had a close-ratio five-speed manual, a limited-slip differential and upgraded front disc brakes from Alpina, for good measure. Another interesting option was the air conditioning, which would eliminate the power steering option when had, as the massive engine wouldn’t allow the space for both systems. So you either sweat from the South African heat but had easy steering, or worked hard at the steering wheel and stayed nice and cool. Old cars, everyone! I’d take the A/C myself, but that’s the Texan in me. The story of the car gets recounted in this video from SentiMETAL, and it’s worth a watch. The 333i is thus a legit Bavarian muscle car, and I don’t mean that in the modern, hyper macho, America-only Dodge Challenger HellDemonScatPackHailSatan Monday Night Football sense, but in the classic and broader sense: what you get when you take an engine from a full-size car and stick it into a related, smaller car. It’s Go Fast 101, pretty much. It’s also an interesting foil to the E30 M3, which famously used a smaller four-cylinder engine and made race car-like high revving its calling card. Plus, the 333i is even more rare: only about 200 were ever built. Is it fair to say this is the most special E30, then? I think it probably is. At the very least, the case could be made. This video recounts the story of owner Arshaad Nana, who owns the local BMW specialist workshop EuroSpec, and how he got this particular white 333i. He even had to restore his after it was found covered in dust and neglected for many years. Count me jealous. Here are some more photos of a 333i playing with a special friend.